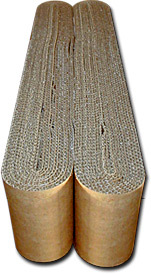 Logs are strips of singleface combined together to the thickness your application requires. Please call us and let us help you determine what grade best fits your shipping situation. Our WRLs™ are an integral element in the LIFT™ Pallet. For more information, click here.